Nancy I. Sanders grew up the youngest of seven children on a dairy farm in Everett, PA. Moving out to Southern California to attend nursing school, she met her husband, Jeff, and decided to stay! Nancy and her husband Jeff have decorated their home to be a nest of books. Nancy, a children’s author, and Jeff, a fourth-grade teacher, both love books, and they both love to read. They also love to sit and discuss ideas for new books and share stories with each other. Not having television in their home since they were married over 28 years ago (except for the occasional movie with their sons), Nancy and Jeff enjoy creating new projects for children whether it be for in the classroom or in a book. They have officially written several books together for teachers. Unofficially, nearly every one of Nancy’s 80+ books has Jeff’s imprint and influence within its pages. Together, Nancy and Jeff enjoy long walks through the hills and trails of Chino and Chino Hills, both suburbs of Los Angeles. On their excursions, they’ve found themselves in the midst of herds of sheep, sheepdogs, and shepherds. They enjoy birdwatching and have accompanied friends to watch as they band baby red-tailed hawks and red-shouldered hawks high in their neighborhood trees. They have two grown sons, Dan and Ben (and Ben’s precious wife Christina), who live and work nearby. Their orange and white cat, Sandman, and their Snowshoe Siamese cat, Pitterpat, round out their family. Please stop by and visit Nancy’s website. Her blog features tips for writers and insight into the life of a writer at Blogzone. 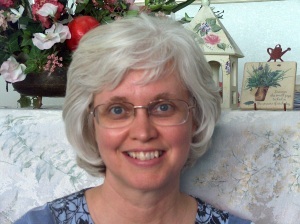 Listen to an internet radio interview of Nancy with Scott McCausey at Christian Devotions Speak Up!